Here at Dynamax we want to provide you with simple answers to your questions. So we have created our easy to follow guide that will outline the components you need to create your own Digital Signage Solution. Lets get started……. 1. 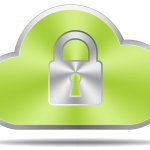 Access to the Internet Cloud. 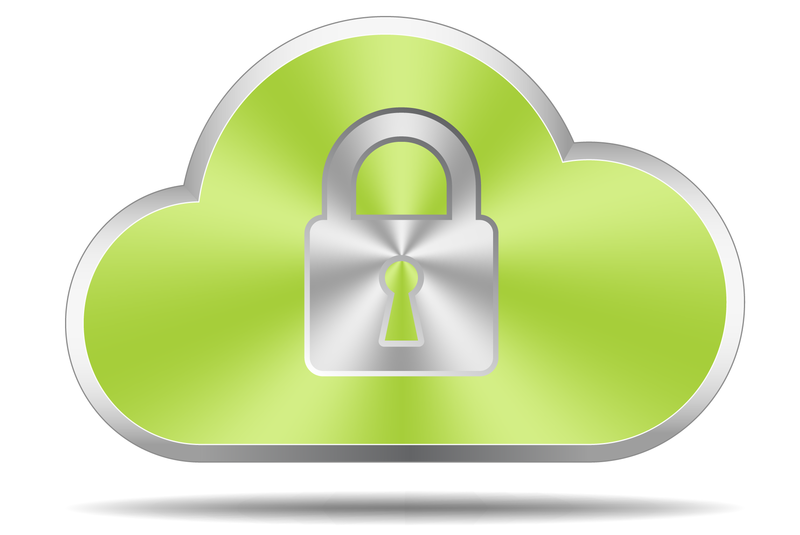 The Cloud is a term used to describe a secure area located on the Internet. It is where computer programs can be installed and access given to many users. We host our digitalsignage.NET software here so it can be accessed from around the world via the Internet. Cloud technology is used by many companies today, including Apple, Amazon, Google for services like YouTube and Netflix. 2. Web browser Computer’s today all come with a web browser and you can download many different versions . You may already use Internet Explorer, Firefox, Chrome or Safari to access the internet to check your favourite web site so you will be use to navigating your way around. digitalsignage.NET is accessed via your web browser. 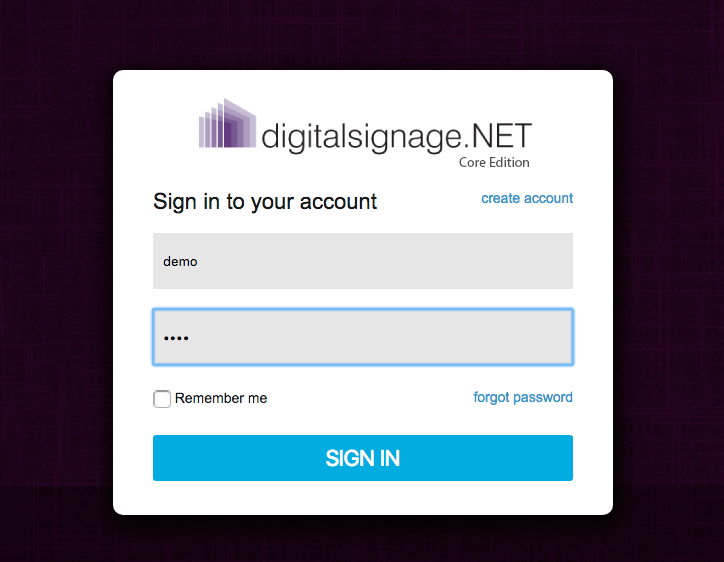 Just type https://core.digitalsignage.net in the address bar at the top of the page and hit the enter key on your keyboard to get to the login page. Don’t have an account? Just click the Create an account link to get Free access with no credit card required. You will need Media Content to play on your digital screen. This could be Video, Images, webpages or News and Social Media feeds. You just select the media type you wish to play and upload it in to the digitalsignage.NET system. Building a playlist of Media Content is easy. You can drag and drop your content into an ordered list or hit the random selection button to shuffle your content making playback varied.Need to set a timed Schedule of content? Just use the in-built scheduler to ensure that your content plays at the right time for your viewing audience. 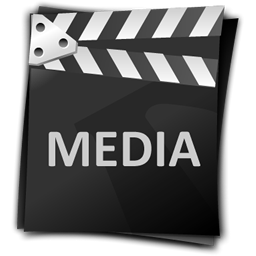 The Media Playback Device or “Media player” is a dedicated piece of hardware that is connected to the digital screen or TV on which to view your Media Content. The Media player hardware device is permanently connect to the screen via a cable and requires a connection to the internet. 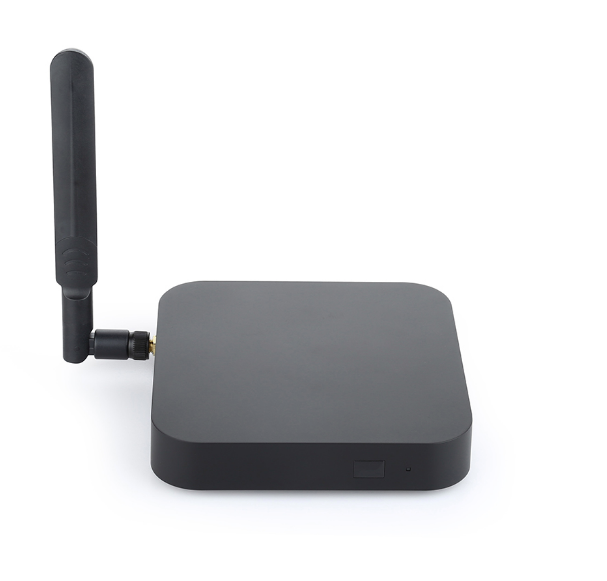 This can be a wired or wireless connection and would be connected to your existing internet enabled infrastructure. 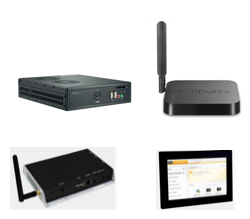 The Media Playback Device will connect to the digitalsignage.NET cloud server automatically and will retrieve any media content you have added to the system. This will then be stored locally on the devices internal storage medium ready for playback on to the digital screen. Should the internet connection be lost at any time, the device will continue to play the media content that it has stored. Once the internet is restored any new media content scheduled will be downloaded. This ensures continuity of playback in the event of any internet outages. 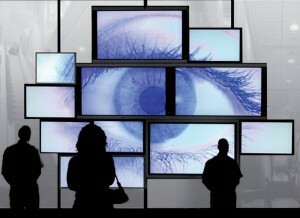 Some digital signage systems stream media content and rely on a permanent internet connection that once lost playback will cease, digitalsignage.NET does not. The digital screen display is the hardware device that will show your media content to your audience, so it is important that this is the correct size for your needs. Too small and your audience will not get the impact of your messages. Too large and they will be overwhelmed. Selecting the correct size and its positioning is vital to a successful digital signage solution. Dependent on your market sector and budget your screen maybe a standard TV, Commercial grade monitor, Large format LED screen as seen in football stadia and transport hubs or a photo frame on a Reception desk. Choose the screen that is appropriate for your location and budget. Like all things that are new to us, digital signage can take some time to learn and you may need a little help along the way. digitalsignage.NET software comes with Free email support, so you will have piece of mind that there will be someone on hand to answer your questions should the need arise. Our experienced technical team is available and our online forums are packed with frequently asked questions and how to videos that will get you through any problems you may encounter. We can also provide you with advice and recommendations on the planning and installation of your solution or we can take the worry away completely and provide a complete solution for you. Speak with one of our sales team today and take your first steps into the world of digital signage.